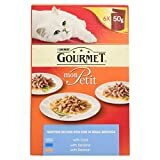 Gourmet Mon Petit Ocean 6pk (50g) GOURMET Mon Petit is a range of exquisite GOURMETrecipes specially developed to let your cat enjoy a widevariety of flavours in the right size for him: fine cuts with meat or fish cooked in delicious sauce for an excellent meal. INGREDIENTS Meat and animal derivatives (of which fish 4%), Vegetable protein extracts, Fish and fish derivatives, Minerals, Various sugars, Yeasts. ANALYTICAL CONTENT Moisture: 81.5%, Protein: 12.0%, Fat content: 3.0%, Crude ash: 1.6%, Crude fibres: 0.05%. FEEDING GUIDE For an average adult cat (4kg), serve 325g throughout the day in at least 2 separate meals.The adult maintenance averages are based on moderately active cats at normal environmental temperatures. Individual needs vary and feeding should be adjusted as required to maintain your cat at a lean, healthy body weight.Fresh, clean drinking water should always be available. This entry was posted in Uncategorized and tagged 300g, Adult, Cord, Food, Gourmet, Pack, Petit, Purina, Salmon, Sardine by One Boutique. Bookmark the permalink.